In May, let me tell you your arms will be full of some many awesome comics. Those comics are the wonderful Kate Bishop in her own solo run as the great Hawkeye, Speedsters like Barry Allen, new superhero team trying to save the world, and plenty of awesome comics I need you to put in your TBR list! One of the great team names in Marvel history returns, in incredible new fashion! 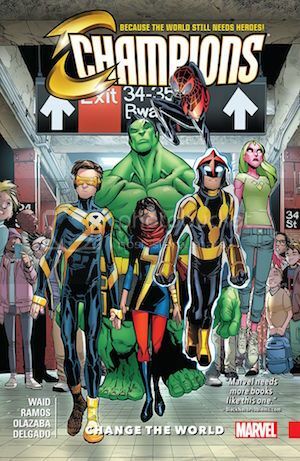 During the fallout of Civil War II, Ms. Marvel, Nova and Spider-Man quit the Avengers and strike out on their own! With Viv Vision and the Totally Awesome Hulk by their side, these young heroes are determined to change the world their own way – and they’re only the beginning! It starts as an idea. It becomes an ideal. But what happens when it turns into a movement – one so big even the Hulk can’t stop it? And will one of the greatest X-Men of all forge a new future by their side? Welcome to the Champions, Cyclops! Unfortunately, not all of your new would-be teammates are glad to see you! Why I’m excited: Look at these kids. These young heroes are gonna change the world, and for the better. This is a team I’d want to read every single day. When the Five Worlds are on the brink of extinction, what are three young kids—a clumsy sand dancer, a kid from the poorest slums, and an all-star athlete—gonna do? Well, just about anything to save their beloved homes. Charlie Dean is a style-obsessed girl who eats, sleeps, and breathes fashion. John Thomas-Smith is a boy who forges metal sculptures in his garage and couldn’t care less about clothes. Both are gunning for a scholarship to the private art high school that could make all their dreams come true. Whoever wins the fashion competition will win the scholarship–and only one can win. Told in the alternating voices of Charlie’s and John’s journals, this hilarious and poignant YA novel perfectly captures what it’s like to have an artistic drive so fierce that nothing–not your dad’s girlfriend’s drug-addicted ex-boyfriend, a soul-crushing job at Salad Stop, or being charged with a teensy bit of kidnapping–can stand in your way. With black and white art custom-created by fashion and beauty illustrator Soleil Ignacio, the book is a collector’s item, perfect for anyone with a passion for fashion. Charlie Dean: Lives and breathes fashion, frequently incorporates French words into her vocabulary (which she learned from Google Translate), is a loner because of the way she dresses, has an addict of a father who’s trying to stay sober. John-Thomas Smith: Loves to work with metal, doesn’t care about clothing and looks down at this art form, has two friends—Barbra and Booker—who don’t seem to want to grow up. What do these two have in common? A desire to, one day, attend Green Pastures Academy of Art and Applied Design, a prestigious art school that will set them up for life. These two will compete in a fashion competition to win the coveted scholarship, and learn about what they’re capable of doing if they set their minds to it. What is this glorious day? May 18th! Just like last year, I’ll keep this short and sweet because I did not prepare like I said I would a year ago. My family doesn’t really celebrate birthdays, so May 18th has always been a chill day (aside from delicious cake). This day will be no different. I’ll be doing my favorites: eating delicious tacos + Korean food, and going comic shopping. On this fantastic May 18th, I hope you do the same—treating yourself to delicious food and all your favorite things in the world. Make the most of your May 18th for me! I demand you treat yo self! I hope you all have a fabulous May 18th! It is eight years after Colleen Cavanaugh’s home world was invaded by the Derichets, a tyrannical alien race bent on exploiting the planet’s mineral resources. But Colleen must decide if it’s worth risking all of their survival to join a growing underground revolution against the Derichets … in Sharon Shinn and Molly Knox Ostertag’s Shattered Warrior. I received this book for free from First Second for review consideration. This does not affect my opinion of the book or the content of my review. For ten years, Colleen Cavanaugh has lived with loneliness and without love. Her home planet has been invaded by the Derichets, an alien race who rule the humans with an iron fist. Day in and day out, Colleen works at a factory with other humans, picking out mineral resources for the Derichets to use for their weapons. Colleen encounters life-changing characters in her life and leads her to join an underground revolution against the Derichets, and will all be okay for her and the family she created?